Nineteen sixty-nine was a long, long time ago – a half century, to be exact, but some members of the St. Stephen River Runners snowmobile remember that year fondly, as if it were yesterday, because that’s the year their club began. The club’s members are planning a huge public birthday celebration to memorialize the 50-year event Saturday, Feb. 9, at various venues in downtown St. Stephen. Everyone is welcome, including nonsnowmobilers. It will start at noon that day at Trobec’s Bar with a Vintage Sled Show followed by a Vintage Ride from 2:30-4:30 p.m. For a complete list of the day’s activities, see end of this story. In 1969, the following newsworthy events happened: For the first time, two American men – Neil Armstrong and Edwin “Buzz” Aldrin – land on the moon; a music festival in upstate New York, dubbed Woodstock, attracts more than 350,000 young music fans; the Boeing 747 jumbo jet makes its first flight; members of the Charles Manson cult murder six people in the Los Angeles area; the Beatles release “Abbey Road” and give their final live performance on the rooftop of Apple Records in London; a motorcycle movie called “Easy Rider” is a smash hit; football great Brett Favre is born; Richard Nixon is elected president; 200,000 people march in Washington, D.C., to protest the nation’s involvement in the Vietnam War. The nonprofit St. Stephen River Runners was one of the first to be organized in Minnesota. There are about 30 active members in the St. Stephen River Runners, but counting members’ children, friends and relatives who love to ride, that number is 40 riders and sometimes far more, depending on the event. There are 14 members from St. Stephen, six from Sartell, a few from St. Joseph, one from Rice, one or two from Holdingford, St. Cloud and Sauk Rapids, and a few from rural areas in the general vicinity. Dan Neid, who lives in Sartell, is the club’s media director. He’s been a member since 2016 when one day he walked into a club meeting and decided to join, partly because he likes the way the club involves spouses and children and how they chip in to do good deeds for towns and people. The two children of Dan and Carrie Neid – Megan, 12; and Ethen, 15 – help with trail work, and Megan helps with snowmobile safety training programs. Neid is a wine-and-beer distributor for the Johnson Brothers Liquor Co.
An individual membership for the club costs $30 annually; a family membership is $35, which covers any children under the age of 18. Meetings are at 7 p.m. every other Wednesday, September through April at Trobec’s Bar. The upcoming ones are scheduled for Feb. 6 and 12; March 6 and 20; and April 3 and 17. Anyone considering joining or just wanting to find out more about the club should just show up at a meeting. The current St. Stephen River Runners club president is Rodney Welch of St. Joseph whose wife, Lori, is also very active in the club. There are 13.31 miles of snowmobile trail the River Runners maintain and groom, most of the trail in St. Stephen and immediately surrounding it. Periodic fundraisers help foot the costs, including maintenance of the big trail-grooming machines. The current trail owned and managed by River Runners connects to the St. Joseph Sno-Joes Trail near Sartell. It also connects to the north with the Holdingford Sno-Flyers Trail. 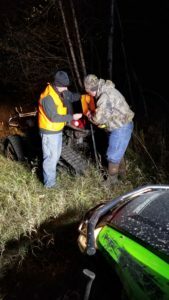 Currently, the club plans to open an access point on the trail to connect with the Sartell area. The River Runners typically host a summer barbecue party at a club member’s lake cabin. They also host snowmobile-raffle fundraisers; safety courses for young people; Adopt-a-Highway ditch cleanups; Community Day trail signage and trail cleanup in spring and fall; a kick-off-the-season party and trail ride; and each year a special ride in another area. Last year, they enjoyed a long ride near Two Harbors in the Lake Superior North Shore; this year, they’re going to Walker. Usually, the ride participants put in from 75 up to 125 miles per day, including warm-ups stops, lunch times and so forth. The club also participates in rides for good causes, such as the Blackwoods Blizzard Tour to raise funds for research into ALS (aka Lou Gehrig’s disease). Some club members participate in the Veterans Day Ride, now in Grand Rapids but formerly in Paynesville. Lack of snow, Neid said, is the annual dread of every snowmobiler because no snow means no fun. • Noon-2 p.m. Vintage Sled Show. Registration, hot dogs and chili. • 2:15 p.m. Judging and prizes for Best of Show and People’s Choice awards. • 2:30- 4:30 p.m. Vintage Ride, for anyone who wants to participate. Any year of sled can join in. • 2:30-4:30 p.m. Games at Howie’s Bar for those not going on the Vintage Ride. • 4:30- 6 p.m. Vintage Clothing Contest and prizes at Rusty Nail Bar. • 6-8 p.m. Entertainment and taco bar at Trobec’s Bar. At 8 p.m. the 50/50 Raffle Drawing will take place, and a meat raffle will last from 6-8 p.m. The first prize is 50 percent of the prize pool, second prize 25 percent and so forth. Proceeds from the day’s events will be used for trail and grooming costs. 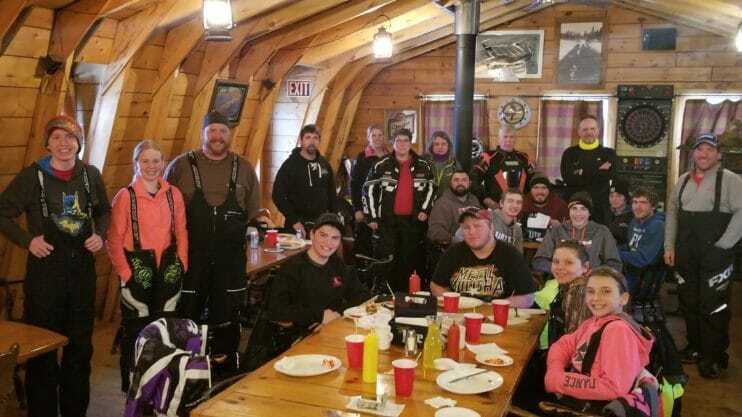 Members of the St. Stephen River Runners snowmobile club gather for a warm-up, lunch and a group photo at the Trestle Inn on Minnesota’s North Shore during last year’s annual special club trip – riding the trails near Two Harbors. Working at night, two members of the St. Stephen River Runners put up trail signage. The men are Paul Radake (left) and Mike Hornung.